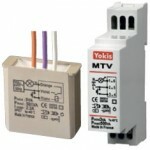 UNIVERSAL: Compatible with all dimmable loads from 0 to 500 W.
Can be connected to other Yokis radio receivers for centralised light control. Full information on how o configure transmitters and receivers and configuration guides for Radio Bus available in Radio Quick Installation Guide. Sine-wave brightness variation, at phase start or end, through automatic recognition of load type. 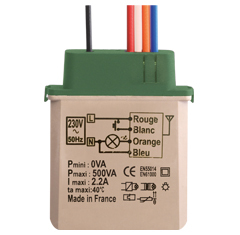 Automatic disabling in case of short circuit on the load, with automatic reset after the fault is eliminated. Range: < 100 sq. m within the same room 50m in free field without obstacles. Range is reduced by metal items, walls or partitions. Transmission: Two-way with notification LED on transmitter.